What we usually get with H-I is a big sprint and this one was much reduced thanks to some indecision on the part of the bigger teams that saw a split on the final climb. 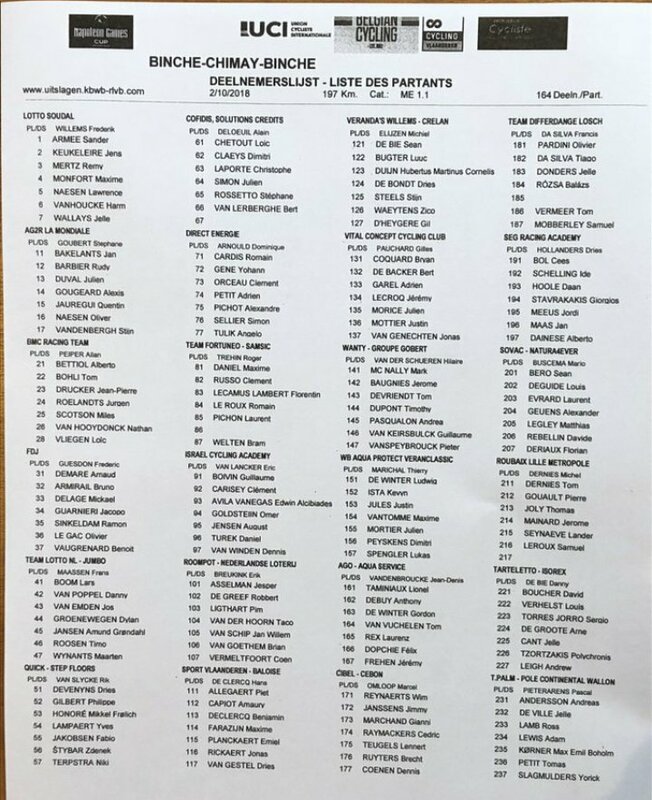 Even so, recent Elfstedenronde winner Blythe was the only "name" sprinter to miss the move and both Van Poppel and Jakobsen still had one or two teammates with them to close any gaps and deal with positioning. Nice to see a full complement of CXers steadily riding into form here. 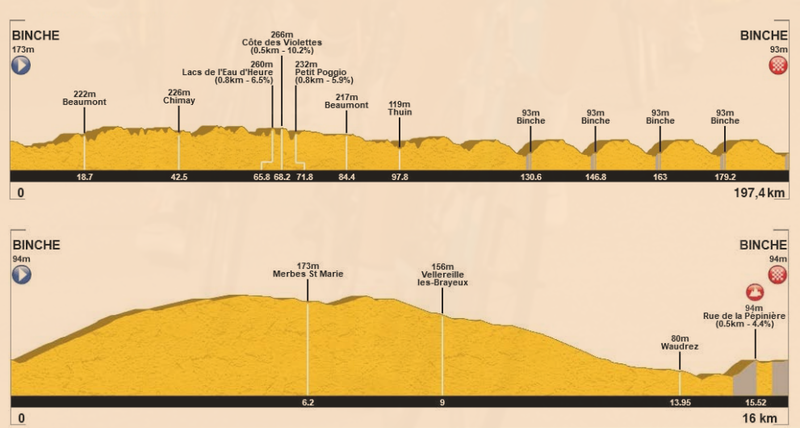 Time was that few would seriously influence a race like this but there seem to be more and more who are clearly talented enough on the road to follow the example of MVDP and Van Aert. 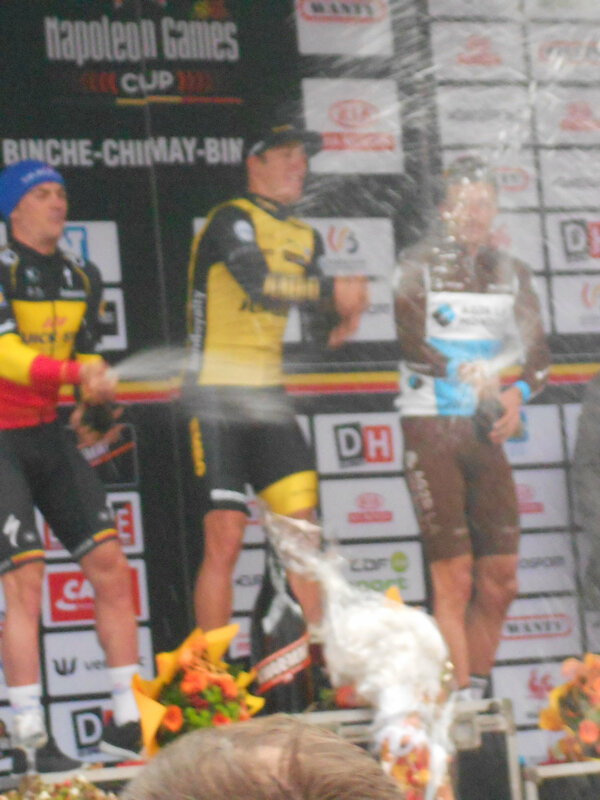 I'll be in Binche for Binche-Chimay-Binche next Tuesday. 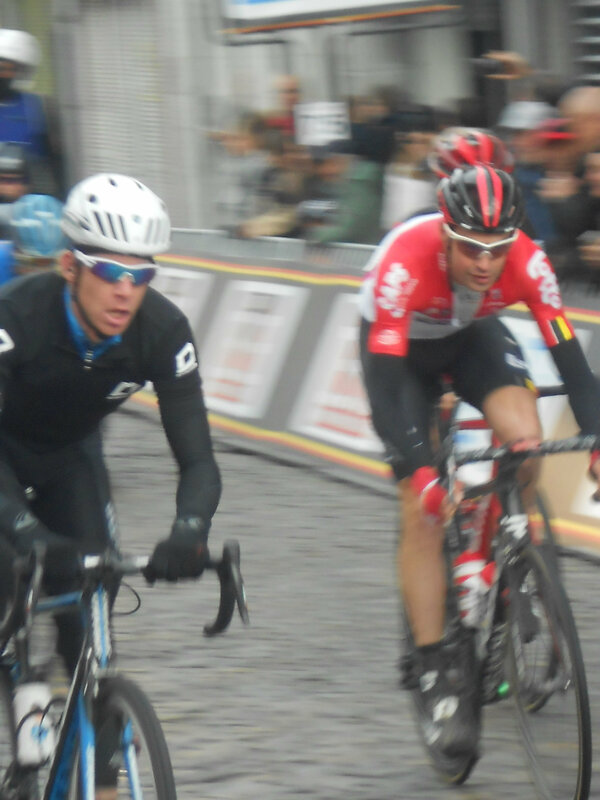 Race was created in 1911 as an amateur race and is as such one of the oldest Belgian races, back then called Binche-Tournai-Binche. It remained unheld between 1931 and 1983, got back in 1984 until 1996 and then resumed again in 2010. 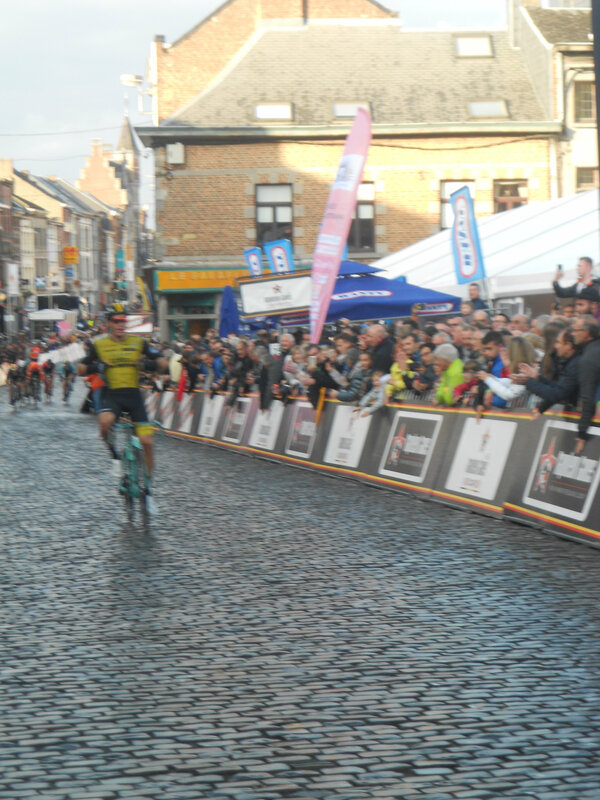 In 2013 the race was heading to Chimay instead of Tournai but still named Binche-Tournai-Binche, only changed its name in 2014. 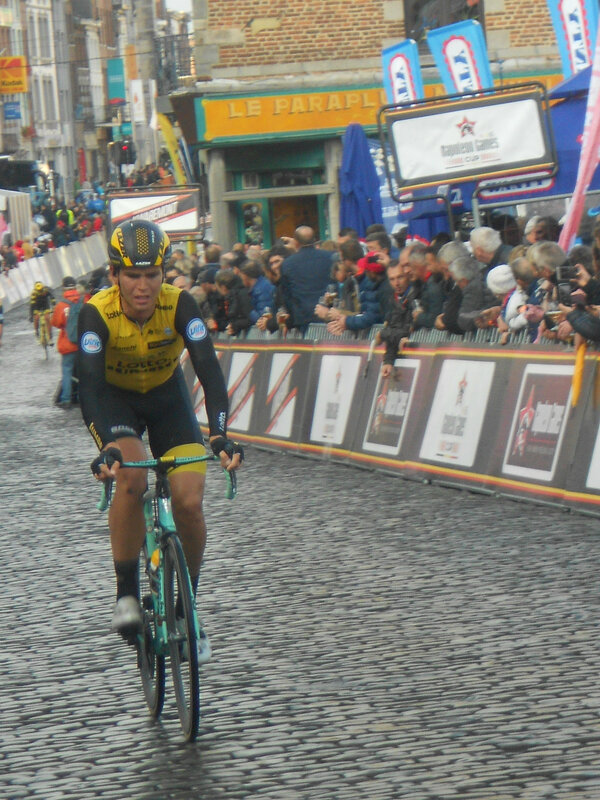 Famous names in its palmares include Adri Van der Poel and Jelle Nijdam. Technical guide Including the teams invited. 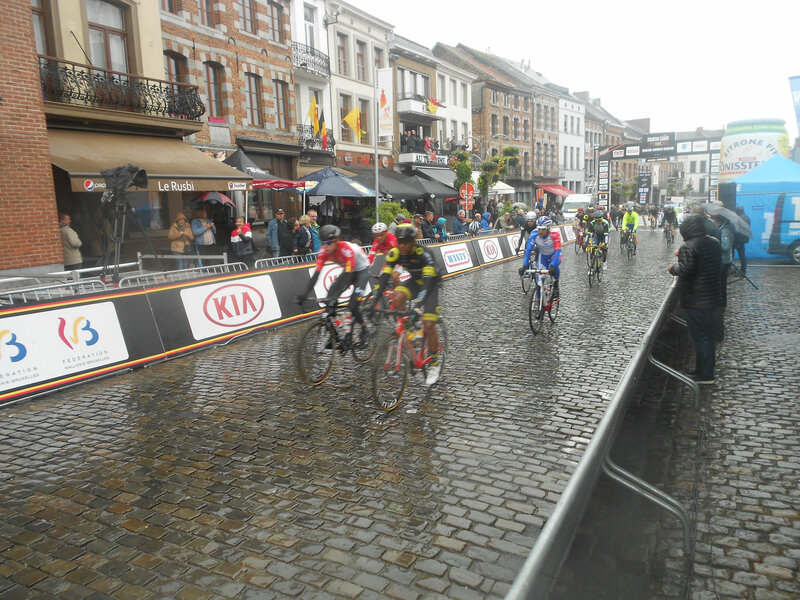 Yup it was raining cats and dogs at the start and rain stopped very soon after they left (at least in Binche, I don't know what the weather was like in Chimay). However there were still short rain periods during the final laps. At some point, we could see on the screen that the riders were racing in dry conditions while we showered at the finish. 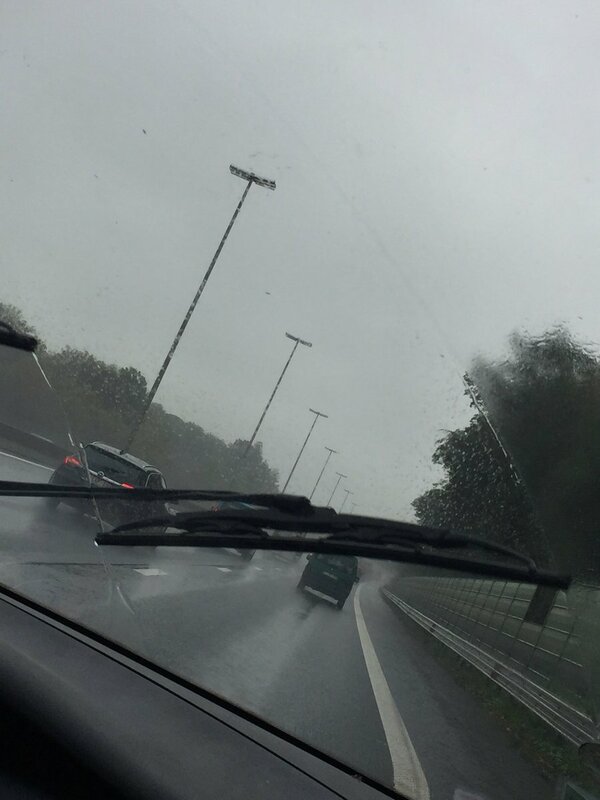 Major problem though, the rain affected by camera lense. I hope some pictures are okay. I'm examining them. 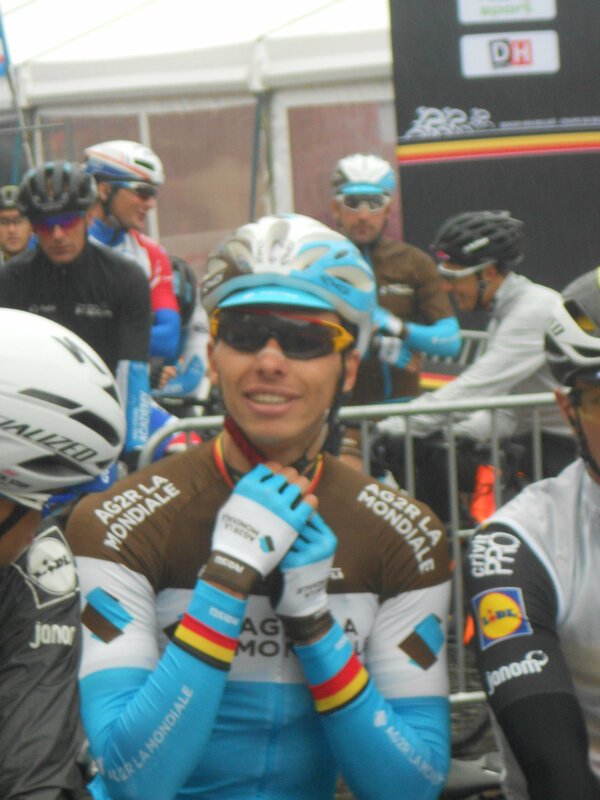 Philippe Gilbert hasn't lost anyting of his popularity. 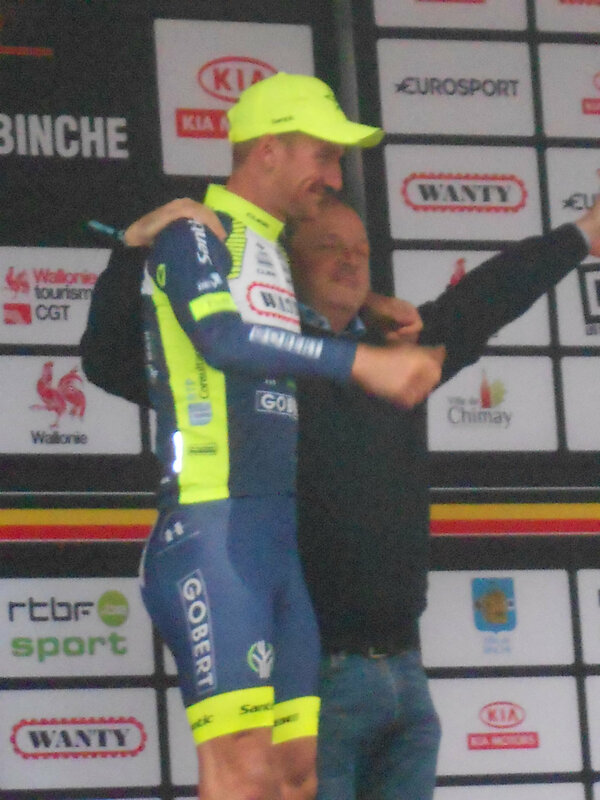 He's the only rider I've ever seen being interviewed on the podium after signing the start sheet and by Daniel Mangeas, the former announcer of the Tour of France. 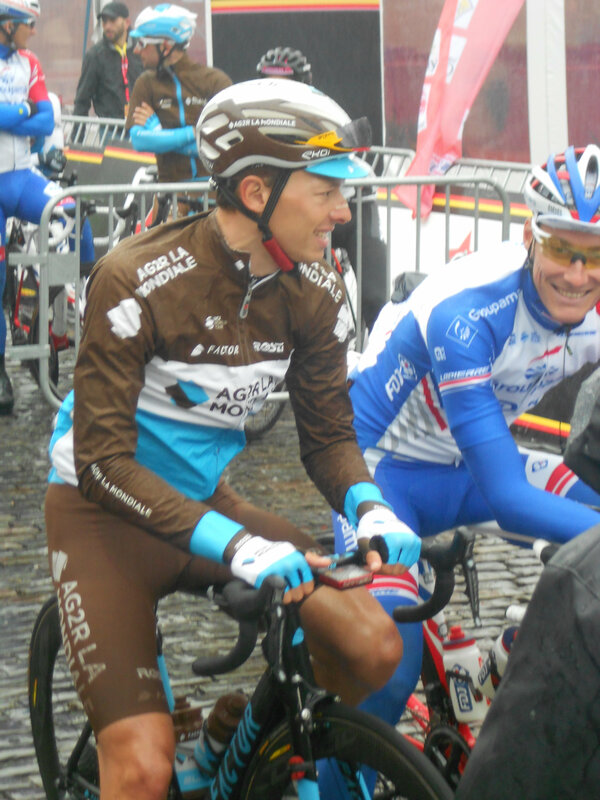 Zdenek Stybar struck me as a real nice guy, yesterday, which I already knew but I mean he was invited to be on the first line at the start along with Oliver Naesen, Arnaud Démare, Maxime Monfort and Philippe Gilbert and he shook hands with the three former riders (Phil being his teammate, they had already greeted, of course). 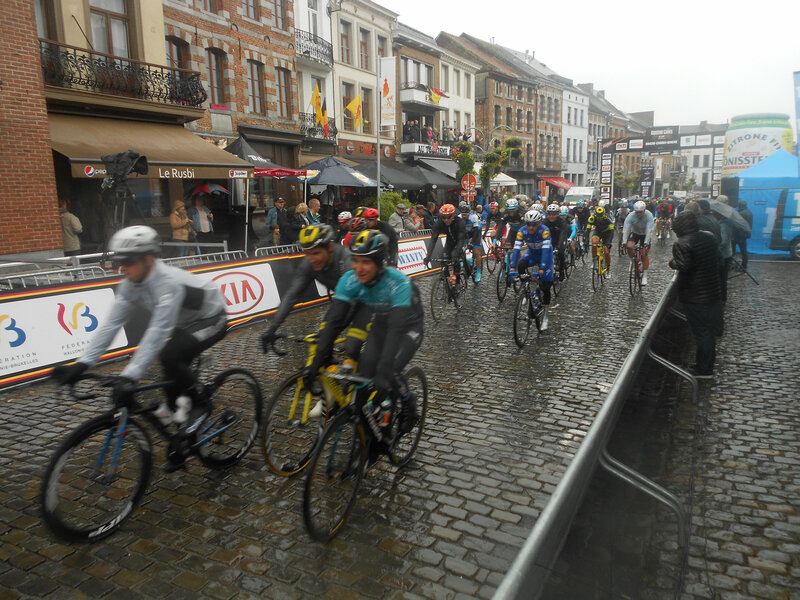 Nice thing for me, I could see the first start, then the real start because they had made a loop in Binche and the real start was on the same start line, then four passages and then the finish where I was very well placed. Perhaps I can be seen on the live coverage. 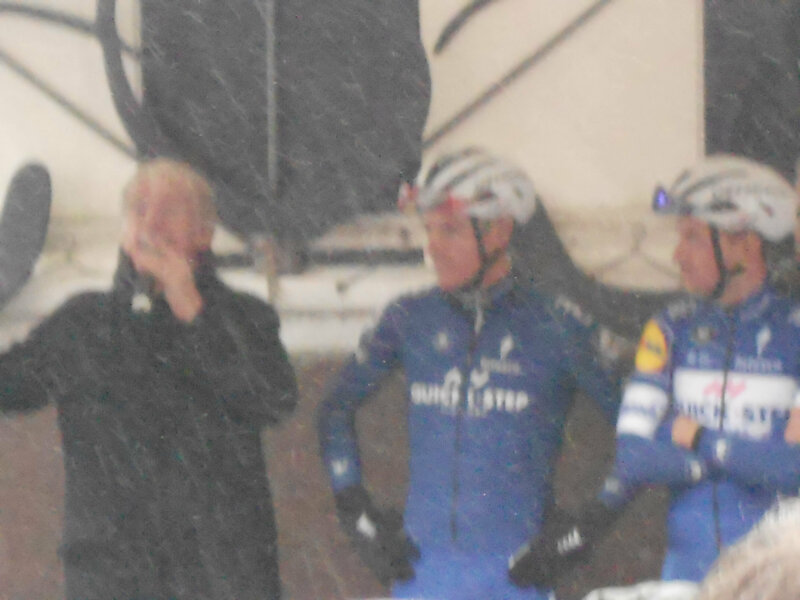 It really started raining cats and dogs and the Quick Step riders came to the start sheet but you could see Philippe Gilbert being interviewed by former Tour of France announcer Daniel Mangeas, good ole Daniel Mangeas. When I first heard the announcer pronouncing Dutch names, I said to myself, "Oh dear, Walloons really can no longer speak Dutch at all" but since he's French, it's more natural, then. 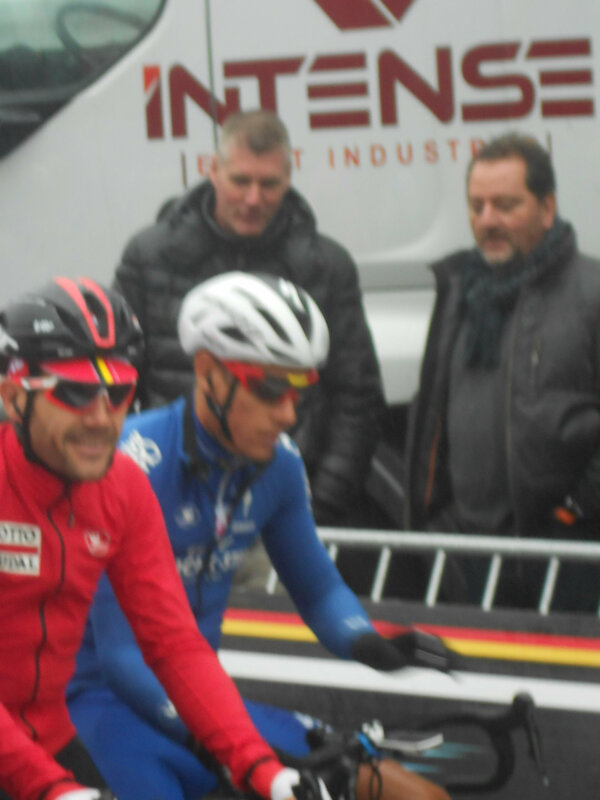 So Zdenek Stybar at the start, along with Oliver Naesen and Arnaud Démare. As I said he shook hands with all of them, which I found very nice. 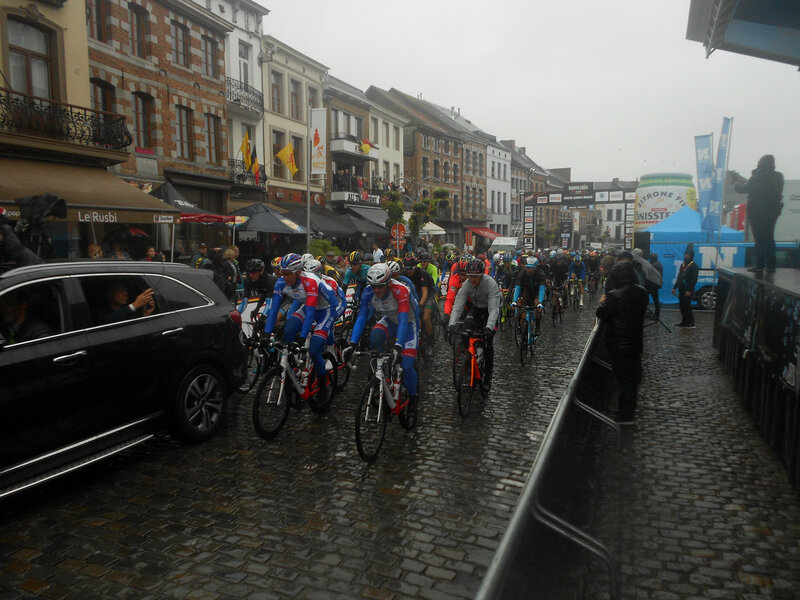 Here the riders are at the real start. I had come to the other side of the way and I must say they took me by surprise. 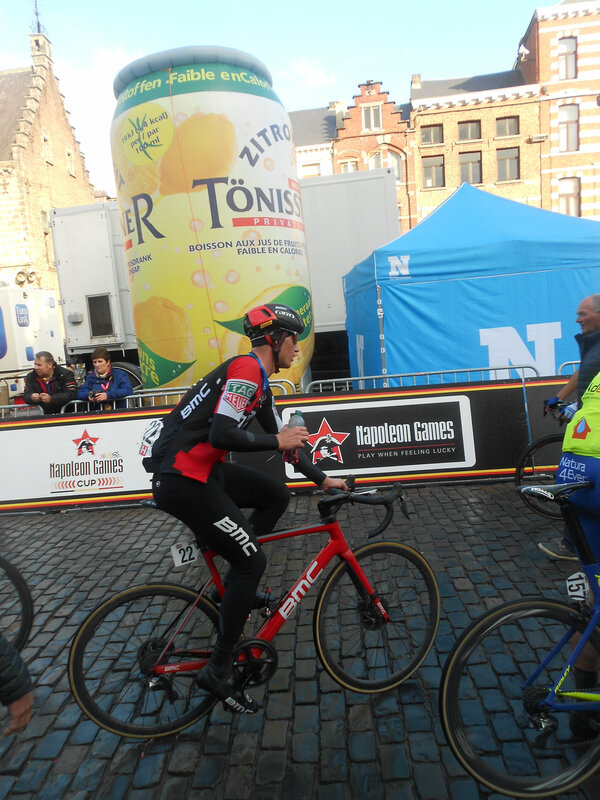 Jordi Meeus seemed to have a knee injury but still seemed OK.
Couldn't get a nice shot of Danny Van Poppel winning while we found an optimal place right after the line. Shame! 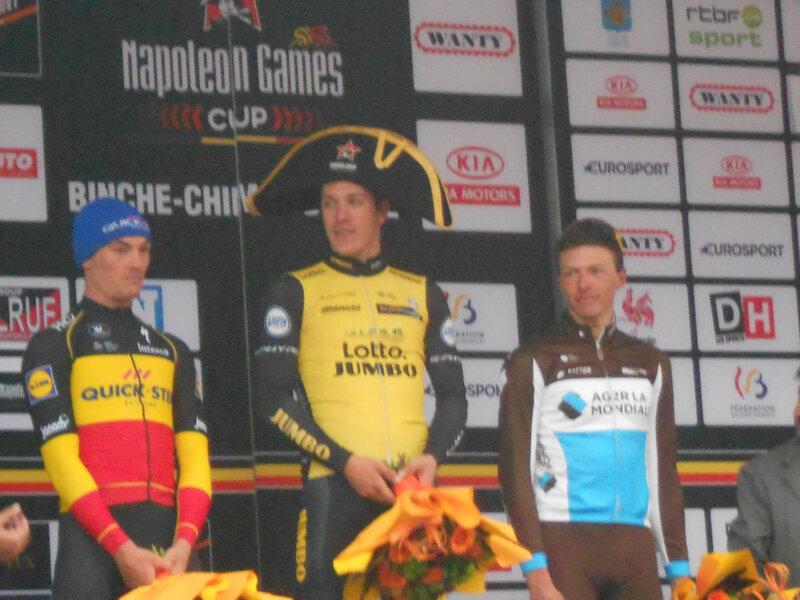 So Yves Lampaert, Danny Van Poppel and Oliver Naesen on the podium. 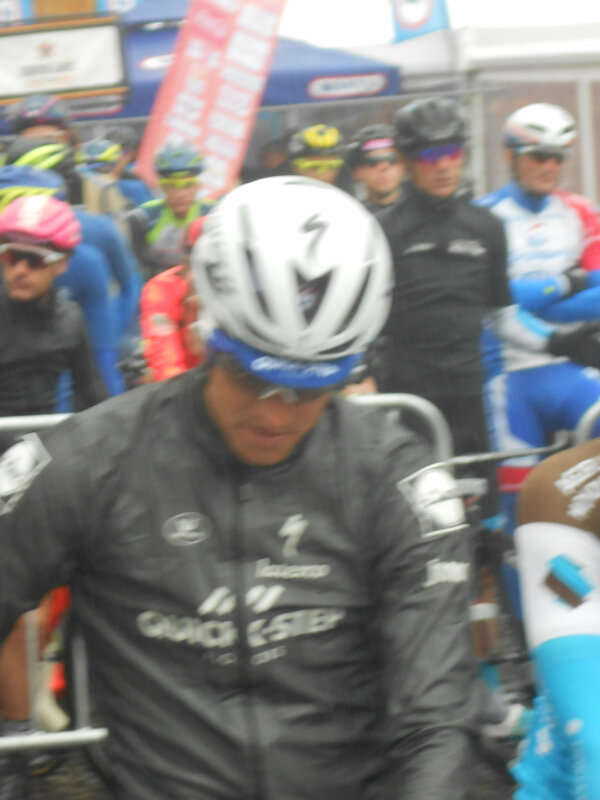 We were just behind Oliver's mother-in-law who was the happy receiver of Oliver's flowers, via an AG2R girl. Somewhere I read that Yves Lampaert paid for a new tractor rather for a Porsche. I like this guy better and better. Timothy Dupont with the big boss of Wanty (also main sponsor of the race or co-sponsor of the Challenge?) 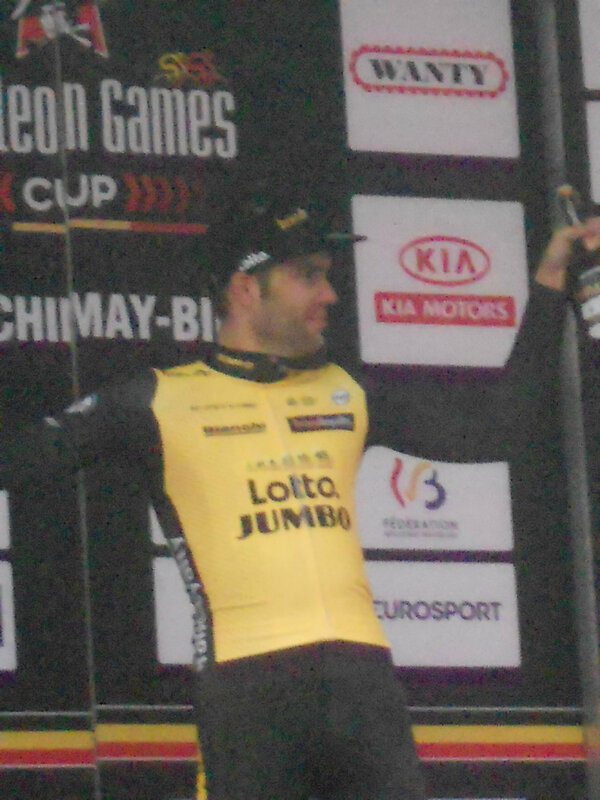 to get the overall win at the Belgian Cup. 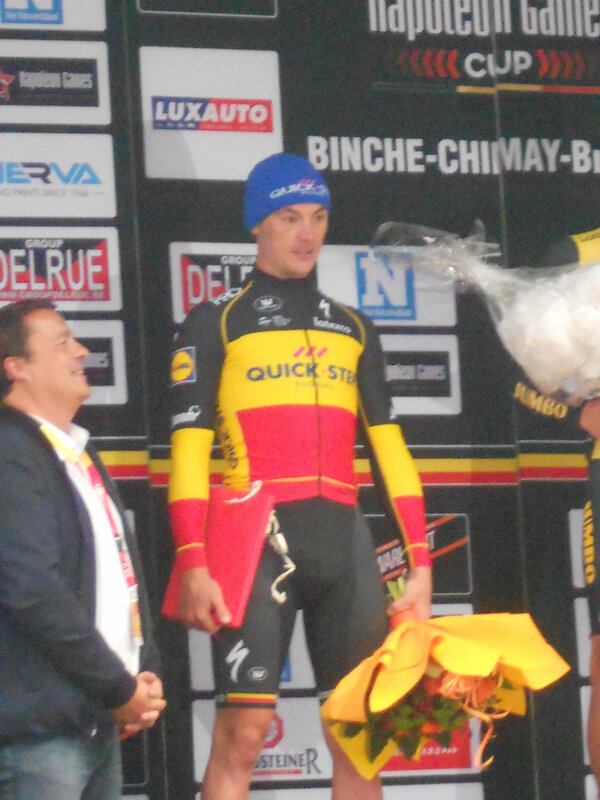 Maarten Wynants also podiumed because he won the sprint in Chimay. This years competition has been pretty decent from where I have viewed it (my sofa). I have enjoyed a fair percentage of the rounds and Binche was a really fitting finale. 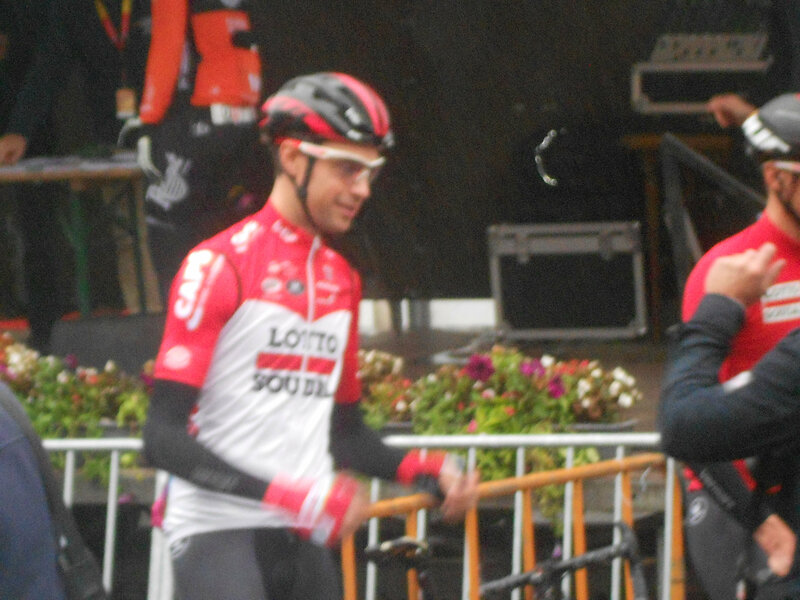 My friend was a bit slack in posting his Youtube videos but he's finally posted one with the team presentation before the start, including the Philippe Gilbert interview at 17.36 under pouring rain. So dedicated to AG, if you come around. 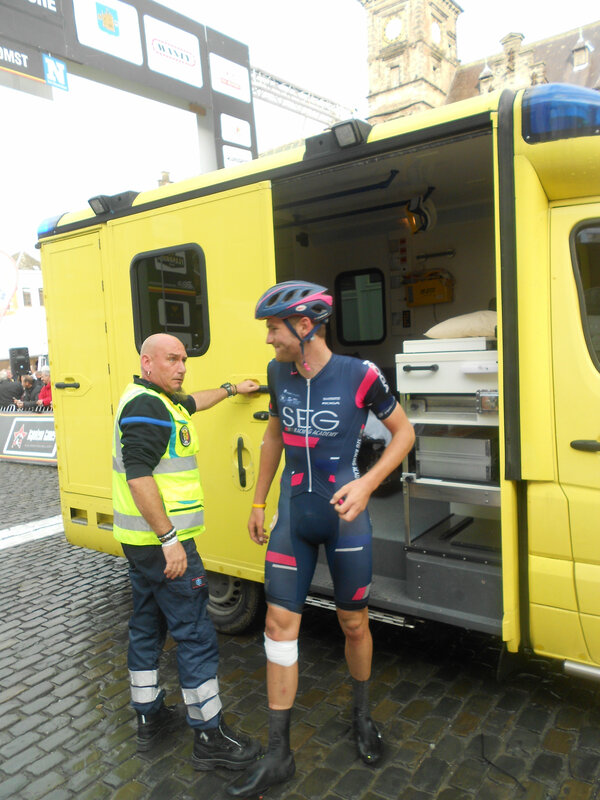 Daniel Mangeas is reminding us about the heavy crash on the Portet d'Aspet, that Phil has always been a courageous rider etc and that he was fully confident as he had just won Isbergues. Yes, these two races are a bit similar and the weather is similar too, so it's a race where you will need to be in the lead. Here in the town it's not too windy but once we'll be on the countryside over there, the wind will blow, leaving room for action. Then Mangeas is asking Phil how long he had to break. For 50 days? No, no. I spend one month with no bike and then one month of training and no I'm happy to be back. Mangeas: "Are you not thinking: such a shame that the season is ending?" Yeah. I'm usually tired by the end of the season but now I'm rather fresh both mentally and physically and I hope it will be useful for 2019 spring and I hope I can win either the Tour of Flanders again or Paris-Roubaix. That is my ambition. 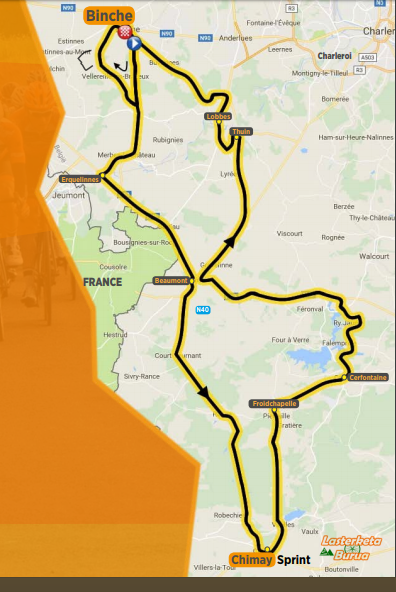 Mangeas: "And perhaps coming back to Binche as the 2019 Tour of France starts from Belgium in order to celebrate the 50-year anniversary of Eddy Merckx' first win"
Yes, many things will be settled for that event and of course you'll need to fight to get your selection because we have a solid team, so you'll have to fight to be there. My friend still has more video to post. More than one even, I guess. 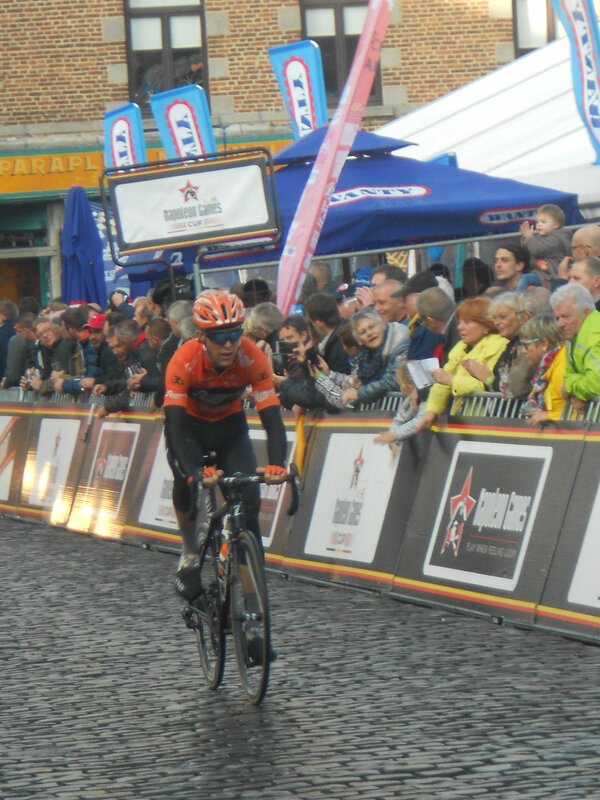 With the real start, the different passages, the finish and the podium ceremony and small vlog in Binche, I think. If you could give him some views, and thumbs up, he'll be happy, I think. I've helped him tag his videos because he's not that much of a cycling fan, only he's living in the area. So I advised him to tag Zdenek Stybar, Oliver Naesen, Arnaud Démare, Danny Van Poppel, Yves Lampaert and Jürgen Roelandts, I think. I feel glad that I somewhat converted him to cycling.